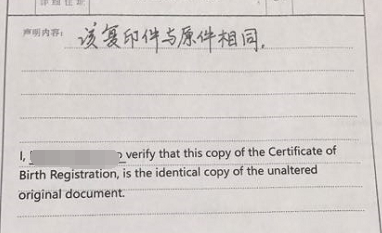 I, ____________________ hereby certify that I am competent enough to translate from English to Chinese and that I have translated the forgoing document from English to Chinese and that the translation is accurate to the best of my knowledge. ______________,is the identical copy of the unaltered original document. I, (applicants name), work as (job title) at (company’s name), the purpose of this authentication is for ( the reason of using in China).